In Clubbing there is loss of angle between nail and nail base. Nails are felt swollen on palpation. 4. Chronic Obsturctive Pulmonary Disease COPD. Which include Emphysema and Chronic Bronchitis. 3. Transposition Of Great Vessels. 2. Pseudoclubbing in hyperthoyroidism. 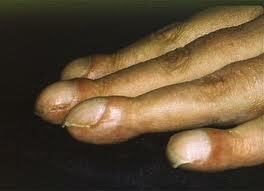 ( there is resorption of terminal phalanx in hyperthyroidism which gives an impression of clubbing.